Less Spend, On Trend : Berryful. I'm absolutely loving the berry, burgundy and wine shades emerging this season so I've been practically dribbling as I've put together this Less Spend, On Trend post! I think I've picked out some real bargains here. I mean, the H&M dress - £3.99! I couldn't believe that price. Although, I'm assuming the deal is only on for a limited time, so you might have to order it soon before it goes up to the usual price of £12.99. I can imagine the side panels make it really flattering. I love fur stoles as they're often twice as warm as a scarf! I'd not come across a berry one until I nipped onto the H&M website. I bought the jumper last week from New Look and it's perfect - comfy, warm and I love the style of it. I'm so glad I picked it up as I've already worn it numerous times - the weather at the moment is making wearing a jumper essential! I managed to get £2 off with my student discount - even better. Are you loving the berry trend too? What's your favourite of my picks? 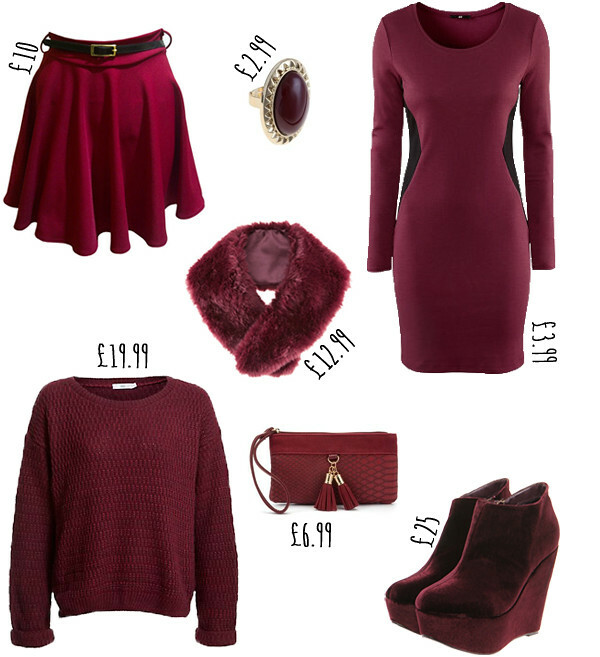 I love the skirt and jumper, great post, gorgeous items and i loveee the colour! Yes I think berry is the perfect shade for autumn too!! I'm also Berry obsessed. My favs are the jumper & wedges! Ah no :(!! I only have it until June so best make the most of it hadn't I :P haha! I love this colour, it's absolutely gorgeous! The jumper looks so cute too!